This project is about converting a BUSMOUSE trackball to the USB HID protocol. This project was created on 05/18/2015 and last updated 3 years ago. A few months ago, I bought a trackball on internet. This is the Trackball PRO model from the famous brand CH Products. It was advertised as being the PS/2 version, but when I received it I immediately noticed it was not. Luckily enough, it came with the original manual and this is how I found out about the BUSMOUSE. The following project logs will give details about its conversion to a more modern USB HID device. This is my very first project here and I hope you&apos;ll enjoy the reading. This is 4 buttons trackball from CH Products, using a huge 53mm phenolic ball. It is a discontinued device, replaced by the DT225. The version I have is the BUS MOUSE one. Other possible versions include PS/2, serial, Sun Microsystems and ACCESS bus. As mentioned, the trackball does no logic nor send serial serial data. Unlike serial mouse, it sends binary signals for the mouse buttons (left, middle and right) and quadrature signals for mouse movements. Back on those times, optical or laser sensor mouse were non-existent. Instead, mice and trackballs were using optical encoder. Basically, an optical encoder uses a slotted wheel and light source + photo detector array to generate a signal. A quadrature signal is a signal generated by a two channels optical encoder. Each channel generates a binary signal depending on whether the sensor sense the light coming from the source or not. Each channel is phased-out by 90°. If the channel A leads, then the shaft is turning clockwise. If the channel B leads, then the shaft is turning counter-clockwise. We came to the same solution and he explains it so well that it&apos;s worth linking it here. I wanted to keep the trackball as vanilla as possible, so I decided not to touch the original PIC16C55-XT/P processor. Debouncing for the mouse button switches. Note: The two upper switches have their own input pin on the PIC side. The BUSMOUSE is limited to 3 buttons, so they act both as middle button or as left/right click-lock (depending on the DIP switches setting). Removing the PIC would allow to use them as button 3 and 4, but as mentioned, I wanted to keep this device as vanilla as possible. It doesn&apos; t pop up that often, especially mint condition and the BUSMOUSE version is even rarer. I decided to remove the original cable from its header, to keep it unarmed, and I bought a new 10 pins harness with 2.54mm pitch. That&apos;s were the Arduino comes into play. Controllers like the Teensy or Pro micro can work as HID compliant devices through the provided libraries. To be totally honest, that was my very first experience with an Arduino. I started this project with a Teensy++ 2.0 (in green), but it was too big to fit inside the trackball enclosure, so I switch to the very tiny Arduino Pro Micro (in red) from Sparkfun. It sports an Atmel ATMEGA32u4 processor and seriously it was a pleasure to program. The original cable was held into place with 3 little plastic bridges. Since the new cable is too thick to reuse them, I used cotton thread and "sew" it through the bridges holes. That&apos;s a very efficient and tidy solution. I&apos;ve been thinking about the same thing but lack time to build one. This is perfectly possible and I&apos;ve seen several DIY force feedback wheel project. All where using micro-controllers and optical encoders. Cool, I will follow your Logs! FYI, I ordered a Optical Shaft Encoder from Aliexpress today and already have some Pro Micro`s and Leonardos. If you happen to know some code for me to test, please let me know! Added software switch debouncing to the code. 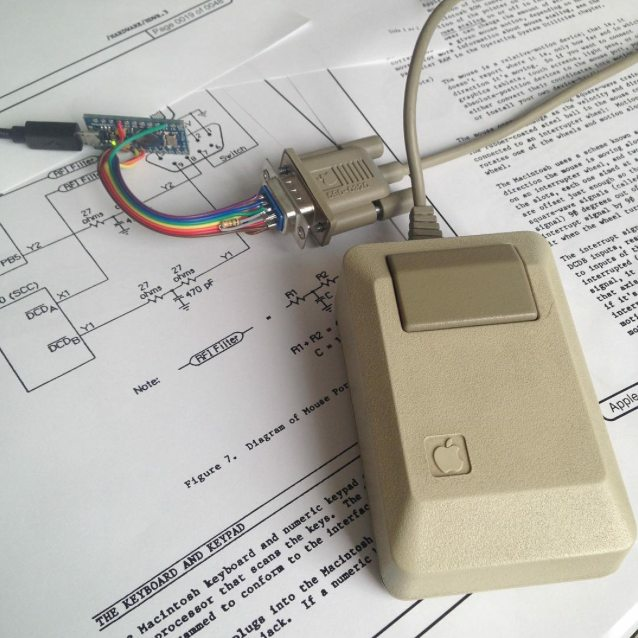 For those interested, this code has been used by Johan Berglund to resurrect an Apple M0100 mouse. You are about to report the project "BUSMOUSE to USB HID conversion", please tell us the reason.